Posted on Thursday, October 27th, 2016 at 8:35 pm. Posted on Thursday, October 27th, 2016 at 2:58 pm. Here in Southern Vermont, we have Stick Season, the season where the autumn leaves have fallen off all of the trees, leaving behind tons of sticks. Stick Season is considered to last until snow falls, and is a time when tourism doesn’t really exist here. We take this time to renovate, clean, and go on vacation before the winter season hits. We will be closed from SUNDAY, OCTOBER 30 – WEDNESDAY NOVEMBER 16. WE WILL re-open with regular dinner/bar hours (Thurs.-Sun. 5-9pm) on THURSDAY, NOVEMBER 17. Thanks for all of your support! We had a really fun Summer/Fall with everyone. See you November 17th! Thanks for the shoutout, Vermont Fresh Network! Posted on Wednesday, October 26th, 2016 at 3:00 pm. Eat. Stay. Do. An insider’s guide to Ludlow. 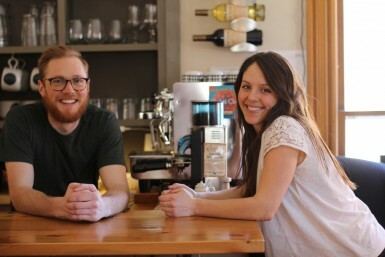 Justin Hyjek and Eliza Greene are the young entrepreneurs (and bartenders) behind Homestyle Hostel – Ludlow’s downtown home-away-from-home for all types of travelers. Homestyle Hostel isn’t your average backpacking stayover – they offer a delicious locally sourced menu, inventive cocktail list, impressive beer selection and accommodations to meet any expectations. Nestled between Killington and Okemo, Ludlow offers both outdoor adventure for every season and a vibrant downtown – including one of Vermont’s most exciting restaurant scenes. We asked Justin and Eliza about their hometown, and what ‘homestyle’ means to them. What makes Ludlow a special place to live and work? Ludlow is a special place for Eliza and I because we grew up here. We returned to Ludlow after nearly ten years away in Colorado, Utah, New York, Oregon and South America to find that our hometown area had gone through significant positive changes. We were pleasantly surprised by the number of great spots to eat and, as we have become a part of the food scene by opening a bar and restaurant in the hostel, we have realized how cool it is to be part of a specific community in such a small town. We see the same lodging and restaurant guests frequently enough that we have been able to develop relationships with them, and we attribute this to the fact that Ludlow is a small enough town that people can be regulars everywhere. What we find most special about having opened a hostel in Ludlow is that this town seems to lure the same travelers back every weekend — it’s great to never have to really say goodbye to people. Our dream of Homestyle Hostel was born through our travels across South America, where we experienced every accommodation there was. It wasn’t long before we fell in love with the concept of the hostel – a basic yet intimate home away from home, with affordable food and lodging for all types of travelers. Inspired, we opened HH to offer this unique experience to people visiting our hometown. We did not open the hostel with the idea of having a restaurant that was open to the public. We built and designed our kitchen so that we could cook family style meals each night to bring our lodging guests together (max of 30 people eating each night). That quickly changed when our cocktail bar caught on with the public and people started requesting food. We’d had very little restaurant experience, but inevitably learned through tons of trial and error. Now, our badass chef turns out dinner for up to 90 people a night in our little kitchen. I’m staying at Homestyle Hostel – what am I eating? Hopefully, you’re eating one of everything. We keep a small, diverse menu that changes every season, and we serve all of our plates family-style, in the way that we send out one or two plates at a time, place them in the center of the table and let everyone get in on each dish. If you order the way we encourage,there’s constantly a new plate arriving at your table. An item that never leaves our menu: a heaping bowl of homemade pasta with different fixings, perfect for sharing with the table. Right now, the setup is homemade linguini with Black Watch Farms brisket, shiitake mushrooms, English peas, kale and squash ribbons in a rosemary cream. Our chef, Alyssa Prouty, is a proud Weston, Vermont native. She has brought some serious culinary skills to the hostel, along with a laid back attitude and positive energy that makes this place go round.Before she came to the hostel, she worked for nearly a decade with her longtime friend Rogan Lecthaler of the Downtown Grocery. She joined us in January of 2016, and has turned this place into a foodie destination—lucky us! What are you not drinking? We have a cocktail list that fully changes every season, with options for every spirit. We’re suckers for bourbon and gin. Aside from the booze and bitters, every ingredient in our cocktails is made in house. We geek out over syrups, puree’s, and egg drinks. My favorite new cocktail on the menu is the Do Wrong Right: Barr Hill Gin, Byrhh, cantaloupe puree, spiced burnt orange syrup, lemon, and sea salt. I’m a beer nerd and put lots of love into our beer list, too. We have four taps, 15+ canned craft beers, and a “Table Beer” menu of unique beers (like Backacre) in 720ml bottles. We encourage people to share these beers among their table. We also have wine. Red, white, rosé and bubbly. Justin is the creator behind the menu and is usually the one behind the stick. Eliza is known to make an appearance on Justin’s nights off, and when the bar gets crazy, she jumps in and splits the tickets. We are consistently working on new recipes and ideas, so it’s a pretty collaborative thing. Our vibe is homestyle: such as would be made at home; simple and unpretentious. The feeling and look is clear that this was once a large home, and people seem to feel pretty at home when they’re here. We have a super eclectic clientele. From single young adults, to young families, couples, business travelers, and old grumpy men (kidding). The driveway is full of the newest Mercedes to the beater car that might die tomorrow. We have the best guests. They make this place what it is, and we can’t believe that we honestly haven’t gotten one turd in the punch bowl yet. Our luck has been plentiful, that’s for sure! What’s your bar/kitchen philosophy? How do you choose your farm/food producer partners? Our philosophy is that fresh is best. For a while, I wouldn’t even pre-squeeze my citrus for the bar, because I wanted everything to be that fresh. We believe in what we eat. We also like to support people with the same outlook. We generally choose our farm partners by the social connections we have with them. When we enjoy interactions with certain farm stands at the Farmer’s Market, we generally stick to using their product. We love Evening Song Farms and Black Watch Farms. Describe a perfect day (off) for you in/around Ludlow? The perfect day off right now: riding my motorcycle, skateboarding with friends at the Dorsey Skate Park in Ludlow, drinking good beers, and eating dinner at either Mojo’s, Stemwinder or the Downtown Grocery. In the winter, the perfect day off is always snowboarding and then hot-tubbing at The Castle in their amazing outdoor salt water hot tub. What else would you like folks to know about your corner of Vermont? Southern Vermont is amazing and so super genuine. For people looking for an authentic Vermont experience, Southern Vermont is the way to go. Posted on Thursday, October 20th, 2016 at 5:59 pm. Posted on Friday, October 7th, 2016 at 8:07 pm. OCTOBER EXTENDED HOURS COMING UP! Posted on Sunday, October 2nd, 2016 at 9:35 pm. We seat on a first-some, first-served basis and take limited reservations for parties of 5 or more. So come on in, and if we can’t seat you right away, we will grab you drinks in our lounge until your table is ready!